In recent years, plenty of people have trumpeted the notion that Europe’s internet infrastructure, as well as broadband prices, are superior to that of North America. Well, they’re not wrong. Central and Eastern European nations, more specifically, are the countries who take the cake. This is especially true when it comes to web hosting. – Availability of fibre-optic internet. – Broadband download and upload speeds in Mbps. – Cost of internet subscriptions. Many of these countries impressive internet capabilities can be attributed to the vast amount of fibre-optic internet readily available. Fibre-based internet is just much faster than standard copper cables, which are widely used throughout much of North America, Western Europe, and China. So how did small countries like Romania, Bulgaria, Lithuania, Hungary, and others become fibre-optic giants? Much of it can be traced back to the fall of the Soviet Union, who left their telecommunications infrastructure to those former Soviet bloc nations. And since their infrastructure was by no means “state-of-the-art” at the time, it forced these countries to build their own digital infrastructure from scratch. This enabled internet service providers to leap past older technologies commonly used in the West, such as dreaded copper wire, and install a fibre-based infrastructure before everyone else. To this day, it is still more convenient and cost-effective for most ISP’s to re-route and reinstall standard copper wire, rather than dig everything up and start over again. Apart from the physical infrastructure, corporate investment, market competition, and local law all play a part in making (or breaking) a country’s internet infrastructure. So how does this all impact web hosting? Simple, a better infrastructure allows European web hosts to access faster, more reliable internet providers, which translates to faster hosting speeds. Also, because of currency fluctuations, European hosting providers are able to effectively reduce operating costs, which allows them to sell quality hosting plans at budget-friendly prices. European web host’s are also have more respect for customer privacy, thanks to their tight-knit data laws. So what are you waiting for? Stop using that slow, unreliable, costly hosting provider from the US – make the European switch now, and reap the benefits immediately. 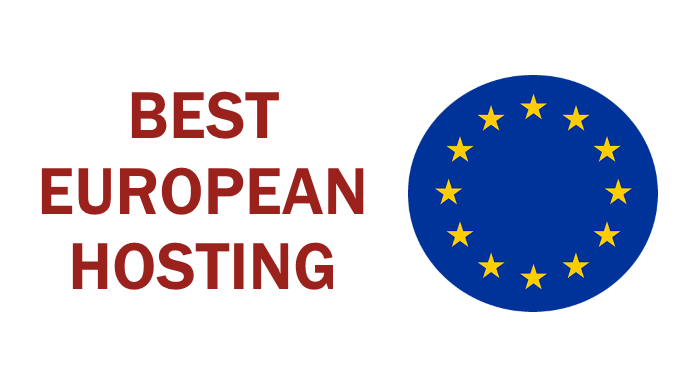 Here’s our list of the absolute best European hosting providers currently available. EuroHost is owned and operated by Access Industry Ltd. and is based in Glasgow, United Kingdom. EuroHost has access to servers in multiple data centers across Europe and the US, where they use SSD drives backed by a multi-homed redundant internet connection. Unfortunately, EuroHost is a reseller. Each EuroHost shared hosting plan includes a free domain name, cPanel, offsite backups, FTP access, WhoIS privacy protection, and much more. They lose points for not explaining their hardware or specifying data center locations. Even though $8 gets you unlimited hosting, because EuroHost are resellers, do not expect a completely flawless service. Ninet.rs has been operational for over 10 years and is one of the only hosting providers in Serbia who own and maintain their own hosting equipment. Their very own data center, NiNet, is located in Nis, Serbia and features redundant cabling and three independent network providers, including: Telekom Srbija, Orion Telekom, and SBB. Ninet is an excellent European hosting option for those targeting an Eastern European audience, though they do lose points for not providing a dedicated IP option, WhoIS protection, and are lacking a number of freebies and add-on’s commonly provided by other web host’s. Hosting includes cPanel and regular hard drive backups. Excellent prices. HeartInternet got its start in 2004 and is based in the UK. They own their own data center, which is filled with high-spec Dell servers running on the latest Intel processors backed by multiple 10 Gbps internet connections. HeartInternet has received numerous industry awards and accolades for their fast and secure hosting solutions. Hosting plans can run on the Windows or Linux platforms and include a free eXtend control panel. This is a good European hosting provider for small to medium size websites, seeing as they give you the option to choose between HDD, SSD, or WordPress hosting packages. Up to date hardware, solid prices, and pure professionalism are also what make HeartInternet a strong European web host. HostEurope is a IT service and web hosting company formed in 1997. The company is based in Germany with servers in environment-friendly data centers located in Cologne, Germany and Strasbourg, France. It is unfortunate that HostEurope charges a $15 one-time setup fee for each new hosting package, and the only way to opt out of the setup fee is to purchase a HostEurope plan on an annual contract. SiteLock protection and their own WebsiteBuilder each cost an additional $4.99 per month. HostEurope hosting plans come with a significant amount of HDD disk space, though we only wish they used state-of-the-art SSD’s and were not resellers. Romarg is Romania’s most prominent hosting provider, and has been in business since 2001. It is unclear which data center Romarg uses, and it also appears the company are also hosting resellers. Luckily, their shared hosting plans utilize enterprise grade SSD drives. Romarg’s European hosting plans run on the Cloud-Linux platform and include LiteSpeed, SpamExperts anti-spam and virus protection, Percona databases, and daily website backups. A dedicated IP address costs $1.95 per month. Reliable European hosting provider using updated hardware and at reasonably low prices – recommended. Velia.net was founded in 2003 and is based in Hanau, Germany. European data center locations include Frankfurt, Germany and Strasbourg, France. Velia is tapped into multiple Tier-1 uplink providers including Deutsche Telekom, Level3, GTT, and TeliaSonera. Each shared hosting plan from Virtono also includes a free dedicate IP address, daily backups, cPanel, and CloudFlare. Virtono uses the Cloud-Linux operating platform. We like that Virtono uses the latest hardware and has exceptionally low prices, with billing available in month-to-month or yearly cycles, the only negative thing about working with Virtono lies in the fact that they are resellers. CloudWays is a cloud-based European hosting provider founded in 2011 and based in Malta. Available European data center locations include: London, England, Paris, France, Amsterdam, Netherlands, and Frankfurt, Germany. Users can also choose to utilize various cloud infrastructure providers, including Amazon, Digital Ocean, Google, Vultr, and KYUP data centers. Each CloudWays hosting plan comes with unlimited PHP-based application installations and a free website migration. With their multiple infrastructure providers, scaling a website with a single click is a seamless, hassle-free experience. Although CloudWays hosting prices could be a little better, their quality goes unmatched. BlackNight Internet Solutions Ltd. is an award-winning, ICANN accredited domain registrar and hosting company. The company was established in 2004 and is privately-owned in Ireland. BlackNight hosting plans are compatible with both Windows and Linux OS. It appears that BlackNight uses its own proprietary control panel. A dedicated IP address costs an extra $2 per month, an additional 30 GB of storage space costs $14.95 a month, while an extra 600 GB in monthly bandwidth comes at an annual charge of $149.95. Overall, decent European hosting alternative for small to medium-sized projects. HostPapa is a privately-owned web hosting company based in Canada. The company has been operational since 2002, has access to multiple European data centers, and has a very large European client base. Each HostPapa hosting plan includes over 200 apps, cPanel, a proprietary HostPapa Website Builder, advanced security features, FTP and SFTP access, a free 30-minute training session, an SSL certificate, and even over $175 in Bing and Google AdWords credit. It doesn’t appear that additional storage space, bandwidth, and other hosting resources can be added as needed, so HostPapa may not be the best choice for business-related websites who need to scale quickly. But in the end, they offer tons of HDD storage space at very affordable prices. One of the fastest growing web hosting companies in Europe is AbeloHost. AbeloHost was founded in 2012. The company maintains its own equipment within a Tier-2 data center located just outside Amsterdam, Netherlands, where customers can benefit from state-of-the-art hardware, data security, and the ultimate level of privacy. In addition, AbeloHost is one of the few hosting providers on this list who readily accept Bitcoin and accept a wide range of content. AbeloHost uses the Cloud-Linux operating platform and throws in a backup function, Spam Assassin, dozens of scripts, advanced security features, CloudFlare, and optional SSL encryption across the board. A dedicated IP address costs just $2 per month. Not only are we impressed by AbeloHost’s high level of transparency and hosting capabilities, but their prices and dedication to quality are hard to compete with. If you’re looking for a reliable, trustworthy, high resource-capable European web host, look no further – AbeloHost is the company you want to work with.